Despite living in one of the mostly densely populated cities in America, Lillian Alling felt completely and utterly alone. A Russian immigrant, the 25-year-old Alling was introverted and reserved, furthering her sense of isolation. In New York in the spring of 1927, Lillian Alling decided to return to her family in Russia. Because she had saved only $100 and would not accept lifts from strangers she would have to walk the 12,000 miles. Equipped with maps, a knapsack and an iron rod for protection, she passed through Chicago, Winnipeg, British Columbia, the Yukon and Alaska, arriving in Nome, the halfway mark for her epic journey, in July 1929. Soon after leaving Nome, she was seen approaching Cape Prince of Wales and that was the last time anyone on this continent is known to have seen or heard of her. She had apparently reached the Cape, as she had planned, obtained a boat and rowed across the 36 miles of Bering Strait to Siberia. That’s a real longing for home. The Israelites experienced the same emotions every time they traveled to a special celebration in the Temple – it was good to be home again. That is the context of Psalm 84; on just such a trip the Psalmist thinks about being home with God. And that sentiment is consistent with each of us. We long to be home in the presence of a loving God. We all have places or experiences where God was very much alive to us. For Abraham it was Bethel. For Moses it was Mt. Sinai. For Jesus it was Gethsemane. For me it’s at church or camp or Bible study with people I love. For the Psalmist it was the Temple. Verse 1:”How lovely is your dwelling place, LORD Almighty!” The place where God lives is beyond expression. It is difficult to understand the impression that the temple of Solomon made on the Hebrew worshiper. David proposed the temple and amassed the materials. It took seven years and six months to complete. God’s presence in the temple was overwhelming when it was first built. Following the resurrection and ascension of Jesus the focus shifted to a different dwelling of God. The church met in homes, synagogues and later built buildings but in every case it is not so much the place that is important but Christ who was worshipped there. The value of any place lies in people and presence of God in that place. To be with God and in His presence, is a delight. There is no place like home. That’s why the Psalmist continues, verse 2: “My soul yearns, even faints, for the courts of the LORD; my heart and my flesh cry out for the living God.” The psalmist delights to be in God’s presence like a baby crying out for an unmet need. While the primary reference here is to worship in the sanctuary, the desire is for the presence of God. That’s why John, in Revelation 21 & 22 ends his description of the new heaven and earth by describing the effects of the presence of God: no more death, sorrow, tears, there is no need for light of the sun, moon, or stars for God Himself will be with His people. That’s why John writes that the ultimate hope is that we will see God in Jesus face to face. Verses 3-4: “Even the sparrow has found a home, and the swallow a nest for herself, where she may have her young—a place near your altar, LORD Almighty, my King and my God. Blessed are those who dwell in your house; they are ever praising you.” The sparrow, by Jesus admission, is worth little; yet it lives in the presence of God. And so do we, we have a home in the presence of God. And the swallow ever restless, never still, always flitting around has found a resting place. So have we! God is our Refuge; God is our Fortress; God is our Haven of Rest. We have perpetual contact with God. None of us is rejected. At home with God we are loved, accepted, valued, and cared for. The Psalmist also says that to be at home with God is to experience his power. When we worship and praise God daily we become acutely aware of his presence and power. No matter where we are, no matter what our circumstances, our hearts are tied to home. A female moth of a rare species was placed in a room. Four miles away a male moth of the same species was released. In spite of smoke of the city, in spite of the distance, and in spite of the fact that the female was in a closed room, in a few hours the male moth was found beating its wings against the window of the room in which the female was confined! Tagged salmon released from Columbia River Point spend four years in the Pacific, then consistently return to the spots from which they departed thousands of miles away. Knowing our homing nature, the Psalmist says, verse 5: “Blessed are those whose strength is in you, who have set their hearts on pilgrimage.” “Have set their hearts” is literally “have highways in their hearts.” Just as the fiery cloud and pillar were the highway map for Israel in the wilderness, so for us Jesus is the way. After Jesus had talked about leaving for heaven, Thomas said that they didn’t know where he was going and wondered how, then, they could know the way. Jesus replied “I am the way.” Through Jesus the way is in our hearts. That’s why we are prepared for our pilgrimage. Verses 6-7: “As they pass through the Valley of Baca, they make it a place of springs; the autumn rains also cover it with pools. They go from strength to strength, till each appears before God in Zion.” Our highways are traveled with strength. Difficult trials are inevitable. Elijah had his wilderness; Moses had his backside of the desert; Joseph had his prison; Daniel had his lion’s den; Job had his losses; Paul had his beatings; Jesus had his Gethsemane and his cross. So we have our illnesses, our job turnovers, our personal losses, our broken relationships, our crumbled dreams. Yet those who live and walk in the power of God overcome and transform these trials. We muster strength through divine inner resources. We go not from weakness to weakness or defeat to defeat but from strength to strength. On our earthly journey through life the further we go the weaker we get. Our vision dims, our hearing weakens and our steps falter. But on our spiritual pilgrimage we gain strength as the journey gets tougher. That is why the Palmist continues that our hope is fueled by trust. Verses 8-9: “Hear my prayer, LORD God Almighty; listen to me, God of Jacob. Look on our shield, O God; look with favor on your anointed one.” In a healthy home the family members talk with one another. If Niki and I take a walk together we are not silent all the way figuring we must wait to get home to speak. We talk with each because we’re together. It is the same with living in the presence of God. We talk and pray with Him all along the way. We can pour out our hearts to Him, because we can trust Him. Whatever our situation today, God is saying “Talk with me. Let me work with you.” If we trust Him we can worry less. The third insight of the Psalmist is that if we are living in God’s presence and power we will experience considerable encouragement of his provision. We long to be at home with God because He cares and provides for us.. Verse 10: “Better is one day in your courts than a thousand elsewhere; I would rather be a doorkeeper in the house of my God than dwell in the tents of the wicked.” We are encouraged by perspective. To be a door keeper, to have the lowest position in heaven, is greater than the highest position on earth. To be of service in the presence of God is the highest privilege of all – and God provides us with that opportunity every day. The Psalmist adds, verse 11, that we are encouraged by plenty: “For the LORD God is a sun and shield; the LORD bestows favor and honor; no good thing does he withhold from those whose walk is blameless.” God the Sun, the source of life. God the Shield the protector from all that seeks to destroy life. As we have accepted Jesus Christ as our Savior our name is in His Book of Life. We are secure. 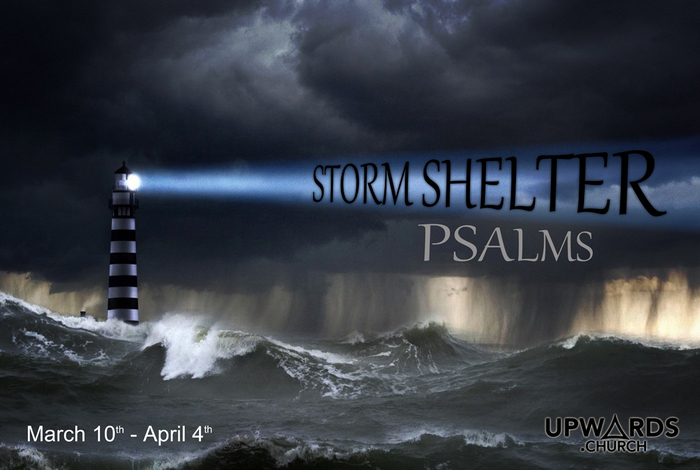 This entry was posted in Storm Shelter- Psalms and tagged church, God's presence, Home, Psalm 84, Shelter. Bookmark the permalink.